...So, why are the warmists so obsessed with denying this? Is the mid-20th century cooling period so “inconvenient” that it has to be erased from history like the Medieval Warm Period? Anthony gets his data from the very people he accuses of erasing it! And from where does Anthony get his information that the northern hemisphere cooled down a bit in the middle of last century? From the records provided by climate scientists. Those very same climate scientists who he accuses of having "erased from history" the information he got from climate scientists! Anthony posted this chart of northern hemisphere temperatures from 1942 to 1978 from woodfortrees.org. Let's put the above chart of northern hemisphere temperatures in context and look at an animation comparing it to the period 1900 to 2013 - and compare it to the southern hemisphere and the entire world. I'll leave his trendlines for 1942 to 1978 in there. When you look at surface temperatures in context of the longer period of rising temperatures, Anthony's wails about all that "cooling" seem a tad out of proportion. And of course, his claim of "erased from history" is nothing but histrionics. How about what the IPCC says about the period spanning 1942 to 1978 or thereabouts. If the temperatures of these decades are hidden, they are hidden in plain sight. Warming has not been linear; most warming occurred in two periods: around 1900 to around 1940 and around 1970 onwards (Figure 2.22. Shorter periods are noisier and so proportionately less of the sampled globe exhibits statistically significant trends at the grid box level (Figure 2.22). The two periods of global mean warming exhibit very distinct spatial signatures. The early 20th century warming was largely a NH mid- to highlatitude phenomenon, whereas the more recent warming is more global in nature. These distinctions may yield important information as to causes. And has this been "erased" from page 10-16 of the IPCC report? 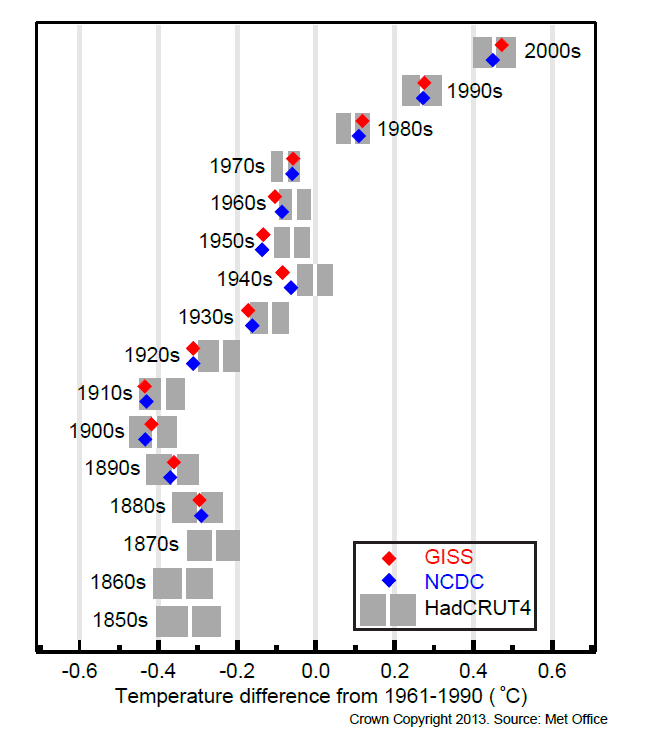 GMST [global mean surface temperature] warmed strongly over the period 1900–1940, followed by a period with little trend, and strong warming since the mid-1970s (Section 2.4.3, Figure 10.1). Almost all observed locations have warmed since 1901while over the satellite period since 1979 most regions have warmed while a few regions have cooled (Section 2.4.3; Figure 10.2). While Anthony goes about un-writing history, climate scientists are more concerned with explaining it. Anthony Watts is going off half-cocked as usual. The comments are just the usual chorus, echoing Anthony Watts denial and disinformation (archived here). This reminds me so much of superstitious religious fanatics: No matter what happens, it is the hand of God. A tortilla with an interesting mark: a sign from God. A cow dies? A portent. A comet passes in the sky, a message form God. AGW is pernicious because it enables its true believers to fool themselves into thinking they are on the “side of science”, and are not simply indulging their prejudiecs and predilections. Think on this: If extreme weather was in fact becoming more frequent, then why do we typically have to look back 20 or more years to find the prior examples? Any particular reason you threw in the nasty hack at people of faith or is it just because you’re a hateful bigot? All that happens is that Mike Freeman gets attacked mercilessly by several other WUWT-ers. The initial impetus for US funding of large scale climate research of the late 1970s and 80s was to investigate the harbingers and timing of the next ice age as insurance against a catastrophic surprise onset. The record is in denial. "If extreme weather was in fact becoming more frequent, then why do we typically have to look back 20 or more years to find the prior examples?" Strange that Watts emphasizes this period. It did not refute global warming and makes the "hiatus" he loves to post about look puny and even less of a challenge. 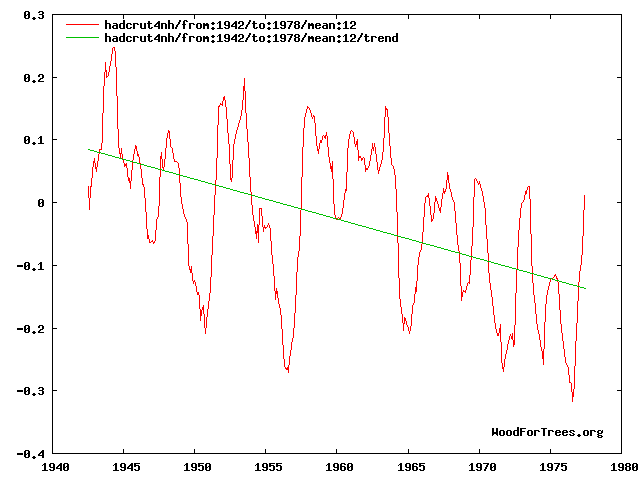 for the mid-20th century pause actually support the science of global warming. The Wuwtians have to ignore the physics of climate forcing in order to pretend that the science is wrong. Intellectual dishonesty and self-delusion are burned into their DNA.